This is the week that it was announced that Jenny McCarthy was joining the popular daytime television show “The View” in the USA. We can take some comfort in the fact that backlash about her appointment has not just come from science blogs and independent media sites, but also mainstream publications like Time and The New Yorker. It’s also timely that Dr. Paul A. Offit, the chief of the infectious diseases division of the Children’s Hospital of Philadelphia, has a newly released book “Do You Believe in Magic? The Sense and Nonsense of Alternative Medicine.” In it he criticizes the negative impact that celebrities like Jenny McCarthy can have on the public understanding and support of good health and science. In addition, he offers a scathing exposé of the alternative medicine industry, revealing how even though some popular therapies are remarkably helpful due to the placebo response—many of them are ineffective, expensive, and even deadly. Kylie Sturgess: I thought that, despite the often incredibly tragic stories that were within Do You Believe in Magic? The Sense and Nonsense of Alternative Medicine, that it was a brisk and engaging read. Was this a book intended for broad audiences, as implied by the rather catchy title? Dr Paul Offit: Definitely. Many Americans, and frankly, many citizens of this world, use some form of alternative therapy, even if it's just large doses of vitamins. Sure, I'm trying to influence the way people think about this. I want them to be just as skeptical about alternative therapies as they are about conventional therapies. The phrase, “do you believe in magic?”—other than the fact that it's a Lovin' Spoonful song—was just engaging to me. It's playful. It's provocative. It's fun. I think, therefore, it is more likely to attract the attention of a general audience. Kylie: I enjoyed where the book opened with your own experiences on being on the other side of scalpel, as it were—being worried about health conditions and how you related to others who might feel similar. They might be scared, or I'm sure, worried, and then turn to alternative medicine. Was there any time during your early career or life, that you thought, “There might be something in it…” about alternative medicine? Paul: No, there wasn't. I think the crossover point for me—frankly, the real reason I wrote the book—was a few years ago when I had micro‑fracture surgery on my left knee. During the recovery, I saw an orthopedic surgeon, who had done the operation. He recommended that I take chondroitin sulfate and glucosamine, because he explained to me this would decrease inflammation and therefore decrease pain. He also said it would help in the deposition of collagen in the area where the microsurgery had been performed, which surprised me. I had certainly never learned about this in medical school! It didn't make either biological or physiological sense that those two substances would do anything to decrease inflammation or do anything to promote collagen deposition, especially specifically in my left knee. I went and looked to see whether there were studies that looked at these two substances in either reducing inflammation or promoting healing. There were a couple studies that showed that it didn't do anything—it was no better than placebo. That taught me that we had crossed over. That there was no line between conventional medicine and alternative medicine. That we had roundly embraced this, I think, largely because we believed in magic. Kylie: Does it raise concerns about medical schools and their practices? Paul: Yes. I think that this is such a powerful, lucrative industry, and they've been so good at getting their message out there. So much so that you have a number of medical schools that have visions of integrative or holistic medicine—Jefferson Medical School in Philadelphia as an example. Our medical students are taught occasionally about homeopathy or how to manipulate healing energies. I think it's a transition from the scientific method—the system that brought us out of the Age of Darkness and into the Age of Enlightenment—to, frankly, a world of magic. Kylie: What are the schools doing? What safeguards exist in order to prevent this from happening? I mean, in general, there must be protection acts and consumer rights for health in the USA. Some of our listeners might not be familiar with them. Are there ones in general, and are there ones for medical schools? Paul: There are two questions there: I would say that regarding the use of these dietary supplements and mega-vitamins, no, there are no protections. At least in the United States since 1994, with the passage of the Dietary Supplement Health and Education Act, the regulatory agency in the United States, the Food and Drug Administration, no longer has purview of any of those products. Therefore, that industry is under no obligation to support its claims or admit its harms. The manufacturing is essentially unsupervised. The label may not reflect what's actually in the bottle. Contaminants are a common problem. Sometimes there are ingredients that are never listed on the label. No, I would say the protections don't exist—which is interesting because I think most Americans probably think they do. I think that when they walk into their pharmacy or their general nutrition center, or their health food store, they assume when they buy something off that shelf, that somebody is looking over the shoulder of the company that makes it, when that's not true. Kylie: So what happened? Seriously, what happened? Did somebody fall asleep on the job, or something like that? It just sounds bizarre! Paul: I think what happened was that over the past thirty years, this industry got more and more powerful and became more and more lucrative. It's estimated to be at least a $28 billion a year industry. They were media savvy. They were politically connected. They were able to push through an act in the mid-1990s, that the New York Times correctly called, “The Snake Oil Protection Act.” That's exactly what it is. The consumer loses. Kylie: The other half of my question was regarding medical schools. Is it a similar thing, big businesses were pushing the schools in order to allow these odd practices to start being taught? Paul: I think that's right. I think these groups have become so powerful, they're able to convince, through the use of money and connections, medical schools to allow teaching this. Actually, I just got an email from a medical student at New York State Medical School in Valhalla, New York. He was upset that he'd just attended a class that was taught by a homeopath. The homeopath explained that his medicine, which by definition is diluted to the point that it's not there anymore, works, and that we don't know how it works because there were some things that science just can't understand. He was really upset about that. He wrote a letter to the Dean of his medical school expressing his displeasure that he had just spent an hour learning about homeopathy in the twenty-first century. The letter that he got back basically told him to be more open-minded. This has nothing to do with open-mindedness. This is nothing about being open-minded to politics or religious beliefs. This is about science, which isn't terribly open-minded, because frankly, homeopathy—as we all know—does not contain an active ingredient. You don't have to be open-minded or not open-minded. The issue is whether or not it is a scientific issue and should thus be discussed in a scientific venue and in a scientific manner, or in a political manner. Kylie: We've got business. We've got politics. There's also celebrity. One large part of the book deals with celebrity endorsement. For example, I didn't know about the case of Steve McQueen, which is something you discuss in the book, and his tragic death due to trusting alternative medicine. Just how influential are celebrities? Paul: Companies pick celebrities to endorse products for a reason. They know that we feel that the consumer believes that they know the celebrity because they've seen them on the big screen or the little screen. They believe, they trust them, and they believe they know them. In this country, people like Suzanne Somers, who promotes her anti‑aging products and Jenny McCarthy, a B-level actress, who promotes her autism “cures.” Jenny McCarthy is about to get a position on “The View,” which is a very popular morning show. So, what is it about Jenny McCarthy that gives her special insight into autism? That gives her insight into the research and development of associated with autism cures or causes? What is it about Suzanne Somers that gives her special insight into how the body and why the body ages? Nothing, they're just actresses. Kylie: I read Jenny McCarthy's first two books, about her son and autism and annotated them in order to find out all the claims—most of it was just anecdotal. She was picking up messages from other concerned mothers and that led her to be convinced. Paul: You could argue that Jenny McCarthy is an expert on her child, that she knows her child best. This doesn't therefore mean that she understands broadly the cause or causes of Autism. Not at all—she's never published a research paper on the disorder. She's never reviewed a research paper. She's never been part of any review applications of the National Institutes of Health. She doesn't know anything about it, really. A number of years ago, Jenny McCarthy, Holly Robinson Peete, and a non‑celebrity mother, were on “Larry King Live.” And I'll never forget this, Larry King looked at the non-celebrity mother and looked at Jenny McCarthy, and said, “What do you think causes autism?” Then he posed the same question to the non‑celebrity mom. And then again to Holly Robinson Peete. Kylie: I've lost track of who first said, “Alternative medicine that's proven to work is called medicine”—you credit Dr. Joe Schwartz at the end of chapter four in your book. But I've heard other celebrities, who I admire, say similar things and yet it doesn't seem to work, in terms of celebrities generally promoting positive, pro-science messages. Do you think there should be an answer in the form of celebrities to speaking out for science? Paul: I hope to live that long! I think it was Tim Minchin, actually, who was the first person who said, “You know what they call alternative medicine that works? Medicine.” He's great. By doing what he does, which is to make science engaging and fun, and skepticism engaging and fun, I think he does a lot for the cause. As a general rule, I think, celebrities—who tend to live in California, in the United States, at least, certainly the movie stars—there is a New Age culture that often embraces an anti‑science point of view. In some ways, they're the last people to stand up for good science. Kylie: We have multi‑billion dollar enterprises pushing alternative medicine—should we have just as much money behind scientists? Would it really make that much of a change, do you think? Paul: I think the one thing to change is the law. For example, in our hospital I'm the head of something called the Therapeutic Standards Committee. We try and decide how drugs or therapies are used in our hospital, to provide some sort of standard. In other words, a physician can't do anything they want in our hospital. If they are engaged in a practice, or a therapy, or a medicine that we don't consider to have clear evidence for safety and efficacy, we review that therapy. We face the issue of dietary supplements. I would say that's the most fifth most commonly used class of drugs in our hospital. By dietary supplements, I mean, melatonin, Co‑Enzyme Q10, Kava, Echinacea, et cetera. There are doctors in our hospital who like these supplements and want to use them. In order to get that on our formulary we have to at least look to see whether there are data showing efficacy, data showing safety, and at the very least, a statement from the manufacturer that the product is what it claims to be. With everything else, the other 54,000 supplements that are marketed in the United States, we could find essentially no clear evidence for safety and no clear evidence for efficacy. Doctors at our hospitals wanted to use these anyway, despite that we could find very few companies that were willing to provide us with even a simple letter that backed their product to be what it claimed to be. It's that bad. Paul: Yeah, I think the term “informed” should be put in quotes, when it comes to this because there's very little information to be had. We, at the Therapeutic Standards Committee at Children's Hospital in Philadelphia have access to all the medical journals and know how to get to them very quickly. The head of our pharmacy is very good at knowing what the most recent data are regarding anything the FDA has seen as far as consumer alert watches. We're very well informed. We can find very little information on this. I'll give you a perfect example. I was on a National Public Radio show in the United States called “Science Friday.” Ira Flatow is the host; they had a caller on the show, who I thought summarized this issue well, although I'm not sure she meant to. She was angry that the Food and Drug Administration had recently approved a drug for the treatment of premenstrual symptom, specifically hot flashes. The drug was Paroxetine. The trade name is Paxil. This was a low-dose form of Paxil, which is often used as an anti‑depressant. In any case, they had licensed the drug, even though the data for efficacy was marginal. You went from five-and-a-half hot flashes a day to four hot flashes a day. There was always the question with Paxil of the increased risk of suicide ideation. Now, the fact is, just because the FDA licenses a product doesn't mean you have to use it. I mean, the FDA doesn't pin people down and make them use these products. What the FDA does, by requiring safety studies and requiring efficacy studies before licensure, is make the company generate data. With regard to black cohosh, there is essentially no data. Now, recently the National Center for Complimentary and Alternative Medicine, which is part of the National Institutes of Health, has done a study on black cohosh and shows it doesn't make any difference. It doesn't even reduce hot flashes by one-and-a-half a day. However, there was recently a problem with black cohosh being found to cause severe hepatic or liver damage. Even though, it doesn't look like it was the black cohosh, itself. It may have been something contaminating the black cohosh, because again, manufacturers are unregulated in this industry. Her attitude was interesting. Her attitude was essentially: “Here you have this big pharmaceutical company making Paxil—marginal benefit. I'm going to go to what I consider a safer, more effective alternative. Even though, it's not safer. It's not in any way as effective.” That's because she puts dietary supplements under this untouchable halo. Kylie: I've also noticed people reacting with shock to an article by you, or at least a citation of you in the Huffington Post, about vitamins increasing risk of heart disease and cancer, which sounds terrifying to me. What did you find personally shocking in the research that you did for the book? Paul: That was probably the most shocking thing. My expertise is in infectious disease and specifically in vaccines. This is not something that I have spent a long time looking at. When I went through the studies, of which there are more than twenty, you clearly find (and I'm not talking about multivitamins, which are at or about the recommended daily allowance, I'm talking about mega‑vitamins) when people take five‑fold, or ten‑fold, or twenty‑fold the recommended daily allowance they suffer these consequences. If you take large quantities of Vitamin A, Vitamin E, beta-carotene, and selenium, you clearly increase your risk of cancer, increase your risk of heart disease, and have the potential of shortening your life. There was one study where the increased incidence of cancer was 46 percent. They had to cut the study short because the data safety monitoring board was so struck by the data! What's interesting in that is that nobody knows it! I didn't know it. I'm in the medical field, and I didn't know it. It was only after I looked through these data that I found that out. What I then published initially was an op‑ed piece in The New York Times. I got a lot of pushback from that. People felt I had attached the “Church of Vitamins and Supplements” and that I should be brought down. The thing that most amazed me, actually, was that probably the biggest lobbying group for the industry in the United States is a group called the Council for Responsible Nutrition. One of my theories is that whenever a group has the either “responsible” or “justice” in the title, you should watch out! They attacked me. They attacked me, personally. They said that I stand alone on this, that this is not the medical consensus, which is absolutely wrong. It absolutely is the medical consensus. This is not a scientific controversy. It's something that generally the public doesn't know, but it's not a scientific controversy. Kylie: What would you suggest if you had friends, family, loved ones who were using alternative medicine, risking their lives? What's the best advice you could give to them? Paul: Just so I'm not setting myself up as having a completely negative view of the industry: I think there is something to be said for the placebo response, which is unfortunately named. I think when people hear the word “placebo,” they assume that it's dismissive, trivializing, that it's just all in my head and that it's not real. I think that in fact, the placebo response can be a physiological response. I think believing that you are about to be helped in some way goes a long way to being helped in some way. Clearly there are studies. There are five books published on the placebo response, each of which has several hundred articles referenced. You can learn, for example, to release your own endorphins, these pain-relieving chemicals made by your pituitary and hypothalamus. You can learn to release your own dopamine. You can learn to up‑regulate and down‑regulate your own immune system specifically via various chemokines and cytokines. That's cool. It think that's really interesting and worth study. Acupuncture is the perfect example of this to me: acupuncture is the product of second‑century BC China. This is a culture that not only didn't believe in dissection, but punished those who dissected human bodies by death. There was a real disincentive to really learn about anatomy. The Chinese believed that there were 365 different parts of the body because there were 365 days of the year. They believed that there should be twelve meridians, the longitudinal arcs ranging from head to toe into which one inserted needles, because there are twelve great rivers in China. If you believe that human anatomy has nothing to do with rivers in China or days of the year, then there's nothing accurate about acupuncture. Indeed, if you look at people who benefit from acupuncture, it doesn't matter where you put the needles. In fact, it doesn't even matter whether you put the needles under the skin! Even these retractable needles seem to work, so‑called “acupressure.” That is interesting! Also, there were some studies. They aren't as strong. If you give those people who benefit from acupuncture Naloxone, which is an endorphin blocker—you actually block the effect. That suggests that at least some of these people are learning to release their endorphins. That's interesting too! I think, then, it's incumbent upon the acupuncturist to figure out in what manner, the lowest burden, lowest risk, the least expensive way to induce this response. It may just be that you're lying down in the office for thirty minutes, smelling incense, and listening to relaxing music. That may be it. Figure it out. You can figure it out. When Mehta Oz on his show says things like, “There are just some things that science can't know,”—this isn't one of them. If you're benefiting from something medical, you can figure out what it is about the physiology or biology of that situation that makes you better. You don't have to look to the gods to understand why! We don't have to do that anymore. We can figure this part of it out. We're not asking how many angels can dance on the head of a pin here! We're asking a scientific question that can be answered in a scientific venue. And I wish we did that—that's the part of alternative medicine that bugs me, this spirituality that borders on mysticism. We don't have to do that here. We can understand it! Kylie: What next? Are you going to be touring with the book? Hopefully, coming to Australia? That would be awesome. Paul: Unfortunately, because I've taken such a clear and definitive stance on the science of vaccines, I tend not to appear in public! I have my detractors. I know this may be amazing to you, but I do have my detractors, Kylie! I do radio and television and certainly newspapers. I'm happy to do that, but I generally don't go to bookstores and speak. I don't find that terribly productive. There's usually one person in the audience that dominates. It's more depressing than it is uplifting. Kylie: Hopefully, I'll get to see you one day at a conference, because it would be awesome to hear you speak live as well. 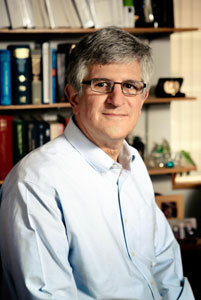 Thank you so much for talking to me, Paul Offit.